The United States Congress designated the Misty Fjords National Monument Wilderness (map) in 1980 and it now has a total of 2,144,010 acres. All of this wilderness is located in Alaska and is managed by the Forest Service. 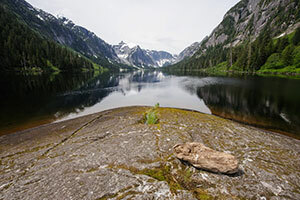 Misty Fjords National Monument includes 2,294,343 acres on the southern tip of the Alaska Panhandle, all but about 156,000 acres near the middle have been designated Wilderness. Misty Fjords is part of a vast coastal rain forest and the cloud-shrouded monument can receive 160 inches of rain annually. The region is marked by deep valleys with steep slopes and sharp intervalley ridges formed by volcanism and carved by glaciation. The slopes appear to be an unbroken carpet of cedar, spruce and hemlock, but the forest floor stands open at numerous muskegs dominated by sphagnum moss. Ridges rise above the timberline to alpine heaths and grasses. Numerous steep-walled inlets of the sea called fjords offer excellent sea-kayaking opportunities, although 25-foot changes in the tides and frequent storms can make boating challenging. Ideal beach camps may be underwater two hours after pitching a tent. Behm Canal, the longest waterway into the Wilderness, runs for over 100 miles and old lava flows and extensive glaciers add to the wonder. Tongass National Forest maintains 11 recreational cabins in the Misty Fjords National Monument Wilderness, 9 on inland freshwater lakes and 2 on saltwater. Advance cabin registrations are required. About 15 miles of wet trails punch into the interior. Winter skiing continues to become increasingly popular, but the avalanche danger often rates as high. Both brown and black bears, mountain goats, and black-tailed deer are common sights. Moose, martens, wolves, wolverines, and river otters may be found in abundance. All five species of salmon share the waters with sea lions, harbor seals, killer whales, and porpoises. Migratory birds, from hummingbirds to trumpeter swans, fill the skies. Planning to Visit the Misty Fjords National Monument Wilderness? How to follow the seven standard Leave No Trace principles differs in different parts of the country (desert vs. Rocky Mountains). Click on any of the principles listed below to learn more about how they apply in the Misty Fjords National Monument Wilderness.